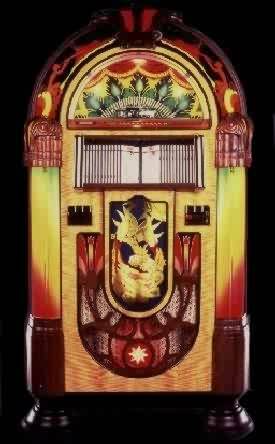 The Peacock is our top of the line jukebox and includes all the classic features. Six bubble tubes, rotating colors in the side columns and the incredible "polarization of light" in which every feather in the Peacock plumes change color independently from the feather next to it. The beauty of the Peacock is equaled only by the quality of its sound. This bird will sing all of your favorite songs with its 360 Watt RMS stereo system.